I have met Pre-distribution. It Wears Clogs, Eats Chocolate, and Works Part-Time. “Predistribution” is Labour’s new policy buzzword. It’s been all over the news. Policy Network has events and publications about it, the BBC talks about it, Ed Milliband talks about it, David Cameron ridicules it. Predistribution is supposed to be the new silver bullet for the centre-left, the agenda that will both create social justice and appeal to voters. But how would it work in the real world? The traditional tool advocated by the left to ensure more equality has been re-distribution. Basically, you let the market do its thing, tax it, and use cash transfers to redistribute the revenues to the poor. The problem with redistribution is that it can never fully compensate for the externalities that the market creates. Moreover, it is increasingly difficult to sell politically, especially in countries like the United Kingdom. In the UK, the middle class doesn’t really have an interest in redistribution because most social schemes are means-tested, and benefits are mainly targeted at the poor only. If you lose your job, you’ll be entitled to Jobseekers’ allowance (56£ or 71£ a week) independently of your previous income. In fact, the drop between unemployment benefits and middle class incomes is so big that the middle class cannot really count on the welfare state as a safety net. They pay for it but don’t get much in return, which tends to create a hostile attitude towards it despite its residual features. As a result, even left-wing politicians are not so keen on it. For instance, Ed Milliband recently said that he would stick to the welfare cap introduced by the coalition. 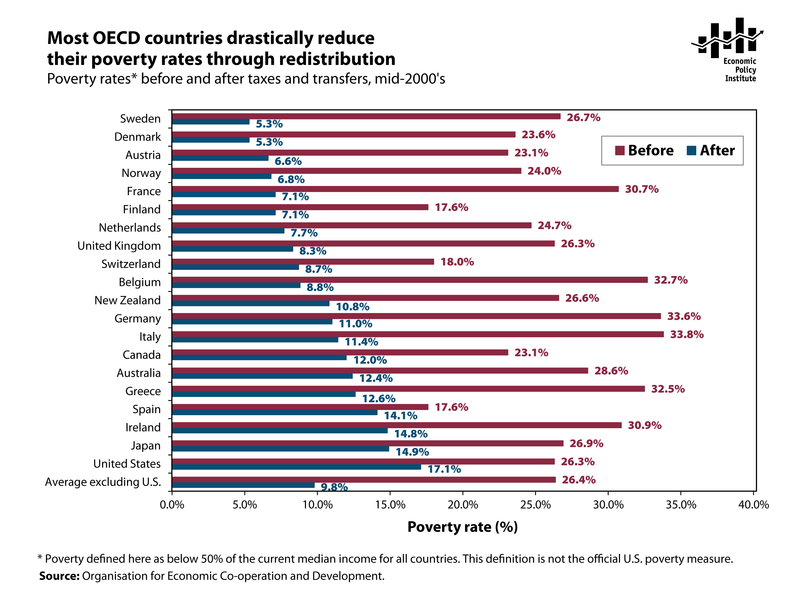 This is what Swedish sociologists Korpi and Palme called the paradox of redistribution: the more you target benefits at the poor to reduce inequalities, the less you actually reduce them. Pre-distribution, by contrast, seeks to reduce inequalities within the market, in order to lower the need for redistribution. Because “mopping up” after the market through taxes and transfers is subject to political backlash, you need to get the market to distribute wealth more equally in the first place. The policies needed to make pre-distribution possible, however, are not very clear. Hacker emphasises “getting the macro-economy right”, ensuring “quality public services”, and “discovering a new set of countervailing powers in the market”. As far as one can tell, pre-distribution is a project whose policies still need to be invented. But does it exist in the real world? According to data from the Luxemburg Income Study, there are two countries where pre-tax, pre-transfer market inequalities have either decreased or stayed at particularly low levels between 1979 and 2005: the Netherlands and Switzerland (Figure 1). By contrast to Scandinavian countries, which rely quite heavily on taxes and transfers to fight poverty, the Netherlands and – especially – Switzerland do not rely that much on redistribution. In fact, due to strong regressive elements in its transfer and tax system, Switzerland hardly redistributes at all, on par with the US, and its market outcomes are fairly equal in the first place. In a forthcoming chapter co-authored with Jelle Visser, we outline the mix of policies that have allowed these two countries to achieve low levels of inequality without the high taxes and transfers found in Scandinavia. In a nutshell, the recipe is a combination of high female employment underpinned by access to part-time work, and welfare and skill production regimes which lift incomes in the bottom half. They are good examples of what Kenworthy calls the high-employment road to low inequality, a variant of predistribution. First, you need high employment rates. The rise of inequality in the West has been underpinned by an increase in the number of high-earners with two incomes, and an increase in the number of low-earners with only one income, or no income at all. These, in turn, need cash transfers. If you reduce the number of households with no or only one income by boosting the employment rate, then you reduce market inequalities. The main tool used to do this in the Netherlands and Switzerland has been part-time employment. These two countries have the two highest proportions of part-time employment in the OECD, and among the highest female employment rates. These two things go hand-in-hand: since they don’t have the publicly subsidized childcare facilities available in Scandinavian countries, part-time employment has been the main channel for women to access employment. For this, however, you need childcare which makes work pay. If their wages are lower than the cost of childcare, it makes little sense for one of the parents to work. Second, you need institutions which lift up incomes in the bottom tier of the labour market. This can be done either with earnings-related unemployment insurance which provides for higher reservation wages, a greater role for collective bargaining, or – probably more importantly – greater collective investment in occupational skills. What underpins income inequalities in the UK is the prevalence of a low-skill, low-wage, low-productivity service sector caused by 30 years of de-regulation. There has been a massive expansion of higher education, but skills at the bottom have lagged behind. In the construction sector, for instance, a large part of the workforce is outsourced, formally self-employed to bypass social security contributions, and craftsmen have to be sourced from abroad because companies don’t provide training. In countries like Switzerland or the Netherlands, by contrast, vocational training and apprenticeship systems ensure a higher level of skills at the bottom end of the labour market, and therefore higher wages. Vocational training also provides for particularly low levels of youth unemployment. In the UK, low means-tested benefits lead jobseekers to accept any job as fast as possible, even at lower wages. In continental Europe, earnings-related benefits give more leeway to select better jobs, ensure a better allocation of workers, and prevent wages below the living wage. These measures do not involve an actual redistribution of wealth, but rather ensure a more equal distribution of it within the market. Because low wages in the UK eventually cost massive amounts of public money through tax credits, better skills at the bottom and easier channels for women’s employment could also be implemented in a context of austerity. Of course, the Dutch and Swiss social models should not be idealized. Dutch households now have the highest mortgage debt in Europe. Austerity policies have now partly undermined some of the policies (e.g. childcare) that had allowed for the employment boom of the 1990s and 2000s. Swiss employment success relies partly on very high levels of immigration which have planted the seeds for the strongest radical right party in Europe. But since the high tax/high transfer policies of Scandinavian countries seem difficult to implement elsewhere, some of their “predistribution” policies may be a more realistic path to follow. This entry was posted in Welfare and tagged inequality, labour, Milliband, Netherlands, part-time employment, predistribution, Switzerland on July 1, 2013 by alexandre afonso. A third way to get reduce inequality: 1) Nordic Model: Tax & Spend, 2) Japanese Model: Limit earnings… or 3)Pre-distribution..
Pingback: Alexandre Afonso | Why do people think that hitting the poor is the best way to cut the deficit?